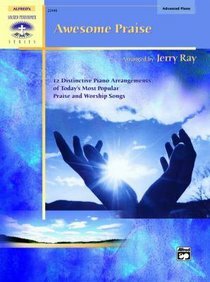 Awesome Praise is the culmination of Jerry Ray's decades of experience in the church, as well as in the educational and commercial music arenas. These 12 arrangements are exciting and driven, prayerful and meditative, majestic and jubilant. Each arrangement is appropriate for teaching, individual enjoyment, offertories, postludes, recitals, weddings, or that spontaneous personal moment of praise. The arrangements are fresh and unique while maintaining a complimentary nod to the original intent of the composer. This collection features songs from the CCLI? Top 25 Late Intermediate to Early Advanced. About "Awesome Praise (Music Book)"